Are you looking to attract new, and potentially lifelong, customers to your mobile notaries public business? If so, consider buying aparty tentand tapping into the bridal market. With average wedding costs and unemployment rates reaching uncomfortable highs, many bridal couples are already turning towards mobile notaries public to help them officially tie the knot. And after glancing at the numbers, who could really blame them? On average, a religious leader typically charges anywhere from $200 to $500 to perform a wedding ceremony whereas mobile notaries public tend to charge $10 to $20, depending on thestate. Of course in either case, thats not counting the cost of the marriage license, party tent rental and any desired accoutrements. Depending on how extravagant a couple decides to go, the final bill could set them back financially around $25,000 to $30,000. That said, buying a party tent and mentioning in your mobile notary public directory listing that youre willing to serve as a wedding officiant could prove to be beneficial on several levels. First, it may attract couples wishing to cut costs or get married in non-religious settings (e.g. beaches and parks). Second, there is a good chance that those couples, and their loved ones, will remember you when they need other documents notarized (e.g. real estate transfers, wills and promissory notes). To make your mobile notary public services and party tent option even more appealing to bridal couples, consider partnering with other entities to create basic wedding packages too. For example, you may want to design a package that includes wedding officiant services, a prenup notarization option, wedding photo and a bridal bouquet from a florist doing business in your area. If you do decide to partner with others and create a wedding package, be sure to provide them with basic marketing materials that they may use to let their bridal couples know about your mobile notary public service and party tent. Examples of materials that may help are business cards that direct the couples to your notary public directory listing and website. 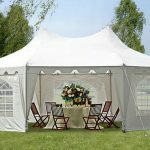 To find out more about party tents that would be perfect for breaking into the wedding market, pleasecontact usat Canopies and Tarps today. This entry was posted in Party Canopies, party tents and tagged party tents on September 11, 2014 by CanopiesAnd Tarps. For instance, you could welcome National Arts & Humanities Month by hosting live entertainment inside of a deluxe party tent. TheAmericans for the Artsfrequently provides free marketing tools and party ideas to help those hoping to end such events on a high note. Some entertainment options to consider are putting on dance demonstrations, art exhibits or hiring a live band. If youd rather look up old friends instead of celebrate the arts, theres always Class Reunion Month events to consider. Our party tents would be perfect places to host a variety of class reunion related events. For example, you could arrange a family dinner for the alumni or host a flag football game for the former jocks. The tents could be set up to accommodate the spectators as well as the players. Do you love the idea of noshing on pasta, garlic knots, bruschetta and cannoli better than reuniting with old school pals? Then order party tents and put on an Italian American Heritage Month event. Serve dinner, show Italian movies and dance the tarantella all while underneath of the tent or make it a simple affair. Simple options include holding a bocce ball tournament for the adults or letting the kids play games like fazzoletto peo peo. Its also Country Music Month time. So you could set up party tents and hold a hoe down or country sing-along. Country craft fairs, country cooking demonstrations and quilting bees could also fit into the theme quite nicely too. Therefore, you may want to keep the party tent up all October long and host those events as well. Coming in last but not least on our October party list is a chili cook off. It just makes sense to have one since it is National Chili Month. And who doesnt love a good autumn chili cook off? While youre at it, toss in a hot sauce competition and little miss or mister chili bean beauty contest too. To discover more fun ways to put your party tents to good use this October, pleasecontact ustoday. This entry was posted in Party Canopies, party tent and tagged party tents on September 11, 2014 by CanopiesAnd Tarps. Why not work with a local PGA member and catering team to host a hole in one event under a tent at a parkland golf course? Let participants make their rounds through the course and then serve refreshments inside of our grand party tents. Some of them may accommodate anywhere from 400 to 500 guests and could be set up to offer attendees spectacular views of the 9th hole. Purchase some of our extra large party tents and hold your own Feed the World style, live musical event. Invite local musicians to participate, generate social media buzz and request that attendees bring donations in lieu of charging an admission fee. Sponsor a food bank workers getaway. It may include a relaxing lunch in our party tents and a golf clinic with experts or, you could hire outside entertainment. If you decide to go with outside entertainment, consider booking a mobile spa service to come in and provide relaxing treatments under a climate-controlled party tent. For more glitz and glam, you may want to use our large party tents to host a celebrity chef dinner extravaganza. Invite area chefs and cookbook writers to serve as guest speakers. Then treat everyone to a fabulous chefs plated or grand buffet style meal. Finally, think about hosting a culinary themed silent or public auction event under one of our party tents. Auction off a private dinner with a mobile chef or hand out tickets to an upcoming, food and beverage industry event. An event to consider is the Annual Nightclub & Bar Convention and Trade Show. In 2015, it will be held just at the Las Vegas Convention Center. To discuss these and other National Hunger Action Month events that would match perfectly with our grand party tents, pleasecontact ustoday. This entry was posted in Party Canopies, party tent, party tents and tagged party canopies, party tents on July 10, 2014 by CanopiesAnd Tarps. If you are looking for a great excuse to entertain business associates, friends or family, consider hosting an International Beer Day event in August using one of our beautifulparty tents. The official holiday falls on the first Friday of the month but that doesnt mean you have to regulate your festivities to just one day. Consider using our party tents to host a weekend long event or transform your local arboretum into a beer garden for just one day. If you decide to go with a dinner event, consider choosing buffet action stations and pairing them with select beers. Take a South of the Border Station as an example. It would pair perfectly with Mexican beers. Similar may be said of Caribbean Grill, Italian Antipasto, Pizza Party, Burger, Quesadilla and Asian Saut Stations.You could also opt to host a series of home brewing seminars or beer tastings in our party tents. If you decide to hold the beer tastings, dont forget to offer food as well. One of your seminars could even focus on how to pair the two together. If none of those ideas suit your International Beer Day needs, keep in mind that our various size party tents would be great for beer balls and fashion show too. Believe it or not, there are clothes on the market nowadays that are made fromrecycled beer bottlesand caps. So you and your staff could set-up a runway and have models strut their stuff in the latest beer fashion items. Afterward, everyone could enjoy cocktail foods, bottled beer, live music and dancing. To learn more about purchasing one of our party tents in hopes of hosting International Beer Day events, pleasecontact usby e-mail or phone. Our party tent experts would be more than happy to help you and your organization put something together in time for the holiday. This entry was posted in Party Canopies, party tent and tagged party canopies, party tents on July 10, 2014 by CanopiesAnd Tarps. 1.) Make a Difference to Children Month" Welcome Make a Difference to Children Month by setting up party canopies at the local park and hosting a picnic. Let the kids enjoy face painting, summer crafts, outdoor movies, old-fashioned taffy pulls and anything else you think would keep them entertained. 2.) National Recreation & Parks Month" Pitch a party canopy and rent out summer sports equipment to celebrate National Recreation & Parks Month. Invite families on a nature hike, host a park clean up or hand out one-day park passes to the needy. 3.) Independent Retailer Month" Recognize Independent Retailer Month by putting up party canopies and holding a sidewalk sale blow-out extravaganza or a shopping themed street fair. And be sure to prime the pump for back-to-school sales in the process. 4.) Womens Motorcycle Month" Holy hog! We certainly cant forget about Womens Motorcycle Month. So invite the ladies to gather under party canopies for a motorcycle run after party or introduce the uninitiated to the joys of hog riding by holding an outdoor sale. 5.) National Ice Cream Month" I scream, you scream, lets all scream under party canopies during National Ice Cream Month. While youre at it, toss one of those ball shaped ice cream makers around or teach everyone how to hand-churn their own sweet, cool treats. 6.) National Hot Dog Month" Okay, so maybe you dont own stock in Nathans. Thats still no reason not to pitch a party canopy and celebrate National Hot Dog Month by holding a hot dog eating contest or dog fest. Who knows, maybe you can even get the town powers that be to agree to let you host a hot dog dachshund costume parade. 7.) National Grilling Month" Its National Grilling Month too. So after your homage to the hot dog is through, keep those coals hot. Because party canopies are perfect places to pop open those folding chairs for a bit of chillin and grillin. And if youre feeling bold, challenge your buds to a Bobby Flay style throw down or make your ownMan vs. Foodepisode. 8.) Smart Irrigation Month" Whether youre a business owner, gardener or just love to run through the sprinklers, it doesnt matter. Party canopies are perfect for Smart Irrigation Month events too. Host lectures on water conservation and hand out rain barrels or promote your firms wares. How you celebrate is ultimately up to you. 9.) Family Reunion Month" Dust off the old record player and cue up the Sister Sledge. Its Family Reunion Month and nothing goes better with it than party canopies. Invite the whole brood over to gather under the canopy and swap memories. Then celebrate with a bit of family made foods and drinks. 10.) Family Golf Month" Lastly, grab your putter and put up the party canopies for Family Golf Month as well. Let the kids play miniature golf or set up a small driving range and serve refreshments under the canopies. Your favorite family duffers will love you for it. To receive assistance in choosing party canopies for your next July shindig, pleasecontact usat (877) 811-3911. We have party canopies in stock that come with assorted top options and enclosure kits as well as folding chairs for sports fans. Shipping is fast and available nationwide. This entry was posted in Party Canopies, party tent and tagged party canopies, party tents on June 12, 2014 by CanopiesAnd Tarps. Block parties are a great way to bring everyone together and foster a feeling of community. If you hope to host one in the weeks ahead, there are several tasks that must be taken care of sooner rather than later. And the list starts with permits andparty tents. Party tents are an essential part of block parties too. They help bring excitement to the event as well as provide shelter for event attendees and organizers. Oftentimes, block party organizers will need to obtain tent permits too. In Redondo Beach,tent permitsare generally classified as a fire department related affair. 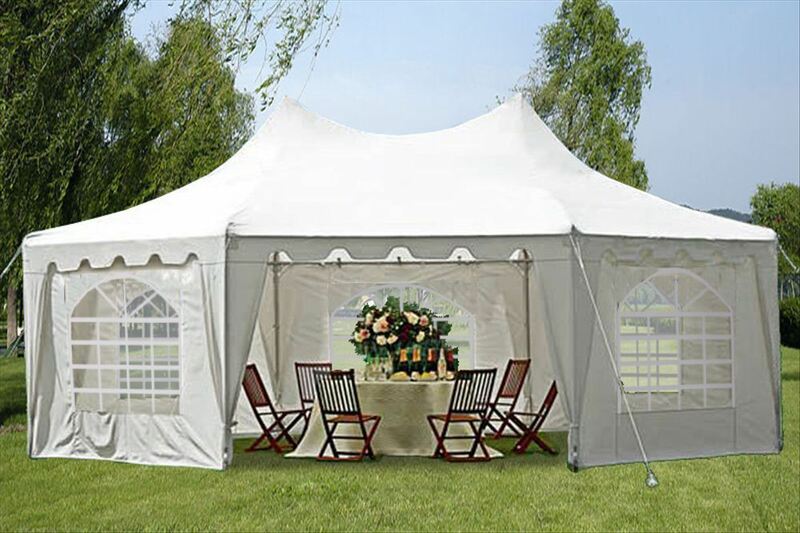 So its vital that you select a party tent that meets or exceeds city, county and state fire regulations. To learn more about choosing party tents for neighborhood block parties, pleasecontact usat Canopies and Tarps. We are a California based business and ship party tents nationwide. Plus, California residents are welcome to stop by and pick up their pre-ordered party tents in person. For more information, please call (877) 811-3911. This entry was posted in Party Canopies, party tent and tagged party canopies, party tents on June 6, 2014 by CanopiesAnd Tarps. With National Wedding Month on the immediate horizon, its time to think about all things bridal. Thats why we wanted to talk about party tents and canopies in todays blog post. They can make a wonderful addition to an outdoor wedding. Todays party tents range from the very simplistic to luxury models that closely resemble a building. They differ from basic canopies because they are typically outfitted with side walls, doors and windows. Modern brides may even add portable dance floors or other flooring materials to the inside of party tents. Party tents also come in different sizes and shapes, which may or may not require clearance allowances. In most instances, clearance allowances must be taken into consideration when buying party tents or canopies that use guide wires, interior pole support systems or storm lines. Frame style tents tend not to need extra clearance because they are compact and without extending parts. They rely on pole legs and metal support systems instead. 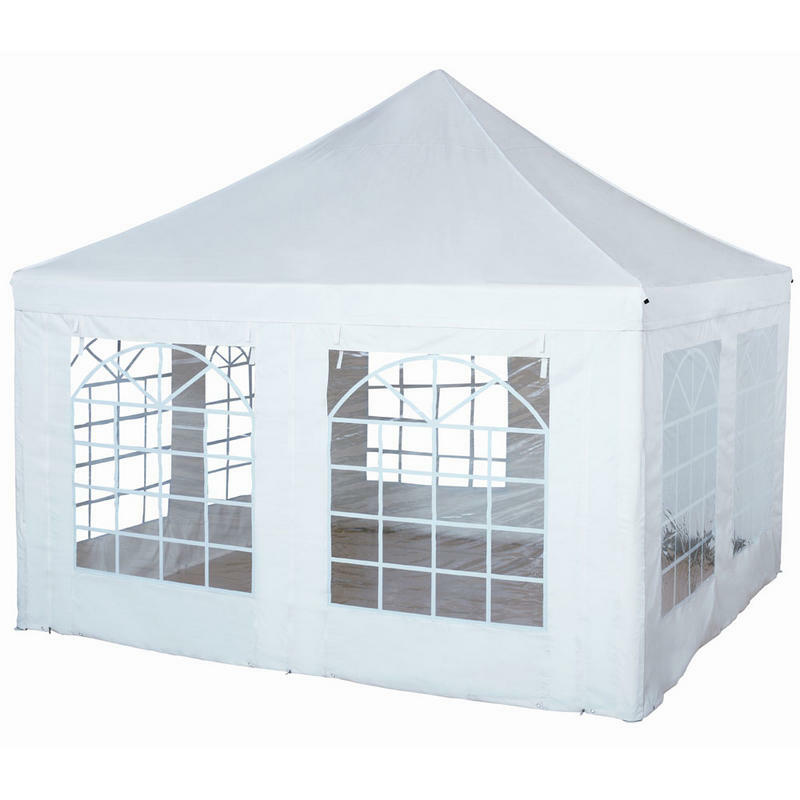 At Canopies and Tarps, we have all different types of wedding worthy models in stock. 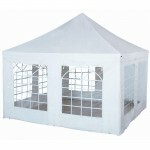 So bridal couples will have all of the options that we mentioned earlier as well as a choice of tent color. Many bridal couples opt to choose solid white party tents or canopies. Others choose to go with striped models or colors that match their wedding theme. Examples include solid blue, yellow striped, blue striped, green striped and red striped party tents. Depending on where bridal couples plan on having their nuptials, a permit and extra liability insurance may need to be obtained prior to setting up the party tent or canopy. So the best course of action is to speak with the property owner, code enforcement agency or venues management first. One of them will certainly be able to shed some light onto which rules and regulations, if any, apply. Once the party tents and canopies are set-up, bridal parties may decorate them as desired. However, its important to keep safety in mind. Oftentimes, the best decorative elements to pair with a party tent are hanging electric lanterns, cool to the touch rope lights, flowers and tulle. If placed strategically, they can help draw the eye away from tent poles or cover them up completely. To learn more about party tents and canopies that are ideal for weddings, please contact us toll-free at (877) 811-3911. If you do decide to have a tented reception, wed also love to have you share your wedding photos with us on Facebook. This entry was posted in Party Canopies, party tent and tagged canopies, party canopies, party tents on January 23, 2014 by CanopiesAnd Tarps.